Build custom integrations seamlessly with AWeber's API. 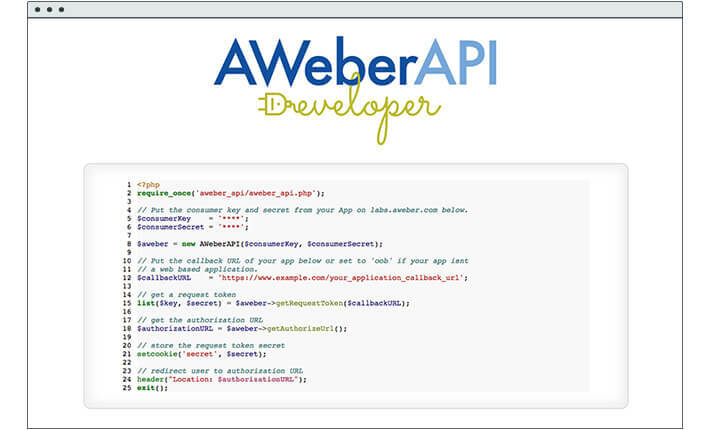 Our API, or Application Program Interface powers thousands of AWeber integrations. Use it to add subscribers, view and edit subscriber information remotely and access message and list statistics. When you tap into the power of our API, you’re using the same service trusted by partners like Unbounce, Sumo, LeadPages, Zapier, and many more. Interested in connecting with an app? Check out our popular integrations to find a service that’s right for you. Want to build something custom? To create your own integrations, visit AWeber Labs, our resource hub for developers. Need support? We’re here for you. Visit AWeber Labs, our resource hub for developers. Creating a developer account is free, and we’ll send you all the information you'll need to start building your first app. Our API team is also available to help answer any questions.